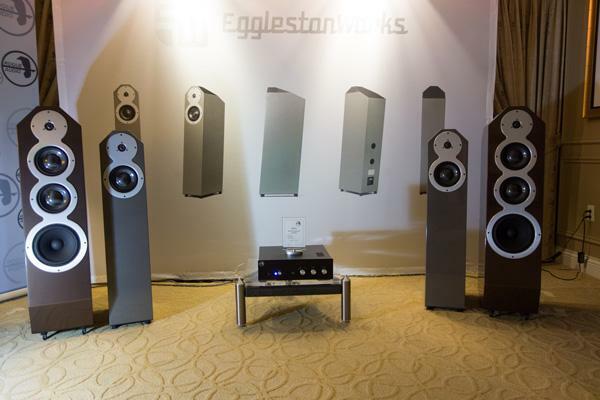 EgglestonWorks, who manufacture loudspeakers in Memphis, Tennesee, introduced a all-new version of their 150 lb, Nine Signature loudspeaker ($18,900/pair). This is a three-way speaker that uses a 1” dome tweeter, a sealed midrange section that incorporates two all-new carbon-fiber 6" midrange drivers, and a new dual-ported 8" bass driver, and is spec'd from 25Hz20kHz, 3dB. 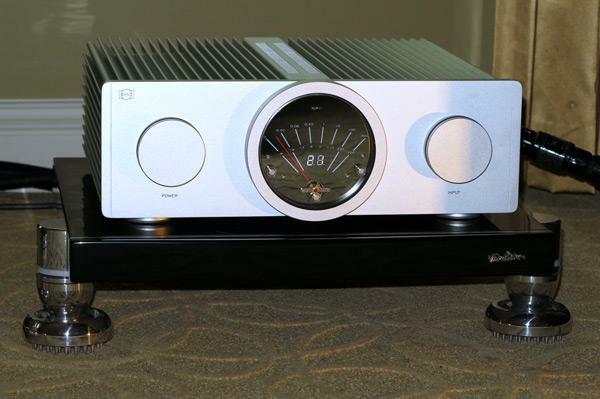 This floorstander was powered by a new Rogue Audio Sphinx hybrid class-D integrated stereo amplifier ($1295), which played digital music files sourced through a dCS Puccini DAC and CD player. 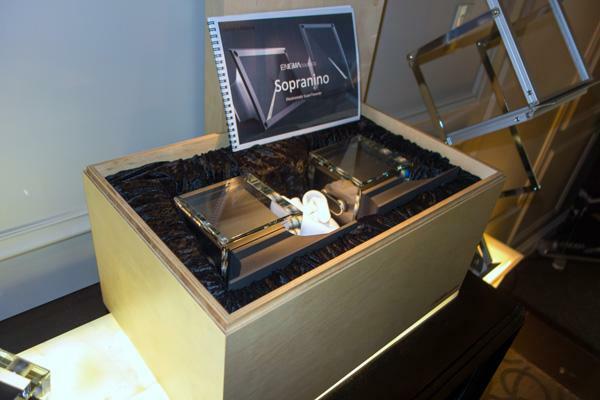 Enigmacoustics' Sopranino add-on electrostatic super-tweeter ($3900/pair) was innovative enough to garner a 2013 CES Design and Engineering Showcase Honors award. Mounted on a gray and white glass stand, the anodized aluminum cabinet and almost square speaker panel is small, measuring 7.2" x 7.7" x 8.3", and weighs 10.4 lbs each. 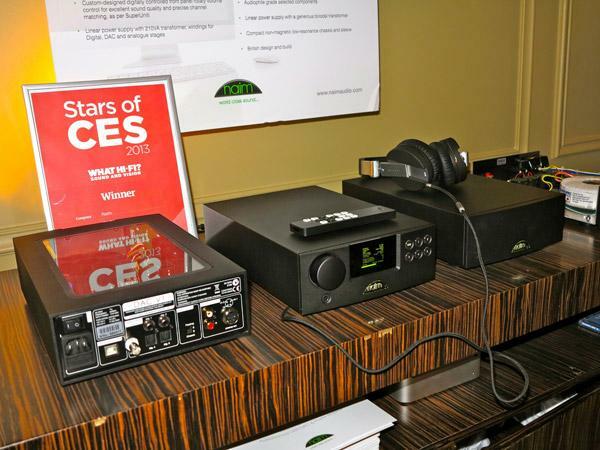 The big news from UK-based Naim is the arrival of the company’s first asynchronous USB DAC, the DAC-VI ($2395). 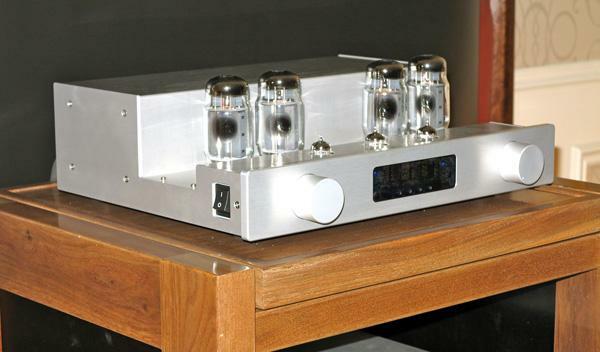 Its companion in size is the new NAP 100 discrete-transistor, compact power amplifier ($1295). Production on both begins in February. To focus first on the amp, which is in my CES blogging territory of amps and preamps in the $2500$15,000 price range, the NAP 100 is a dual-mono design that outputs 50Wpc into 8 ohms and 100 into 4, and is said to incorporate a linear power supply with a “large toroidal transformer and audiophile grade selected components” into a non-magnetic, low resonance, compact chassis and sleeve. Beneath the striking fascias of B.M.C. electronics lies some advanced engineering. As best I could gather from a rather zippy introduction that had me scrambling to write everything down coherently, the B.M.C. M2 monoblock amplifiers ($7790/each) contain LEF (load-effect-free) circuitry that delivers the signal, voltage, and necessary current independently. This purportedly allows them to handle complex speaker loads without need for global feedback. (There’s more to say, of course, but I don’t trust my scrawl.) The M2 outputs 200W into 8 ohms, and 380W into 4. Designed in Germany but manufactured in China, each monoblock weighs 88 lbs and includes a 2kVA transformer. There’s good news for audiophiles who miss the distinctive sound of Edge electronics. They’re back, albeit under another name, with designs updated and prices significantly lower. 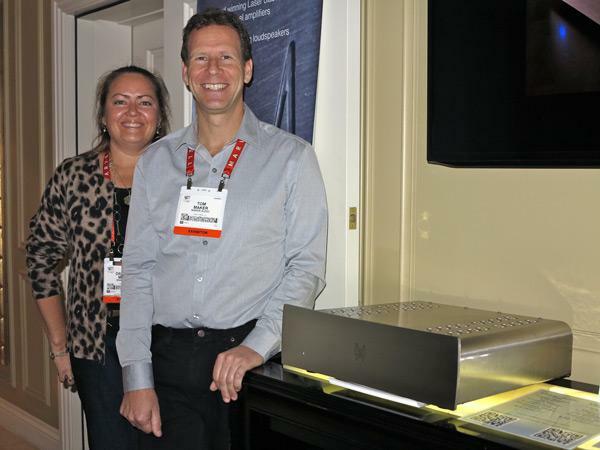 LA Audio was but one of many companies who journeyed to Las Vegas in hopes of securing U.S. distribution. New to their line is the P-845 II monoblock ($12,000), a push-pull design that outputs 60Wpc and has a frequency response of 20Hz100kHz. This is the most expensive product from a company with a 20-year history in Taiwan. The new Octave V110 push-pull pentode integrated amplifier ($8300) from Germany, distributed by Dynaudio, is a KT120-based product whose protection circuit is described as “bullet proof.” To demonstrate what that means, speaker wire terminations on one of the channels were intentionally crossed; not only did nothing blow, but the left channel, which was properly connected to a loudspeaker, continued to play. The Octave V110 is thus the perfect amp for folks who use battery cables to jump-start their cars, and then celebrate by clapping both clamps together. 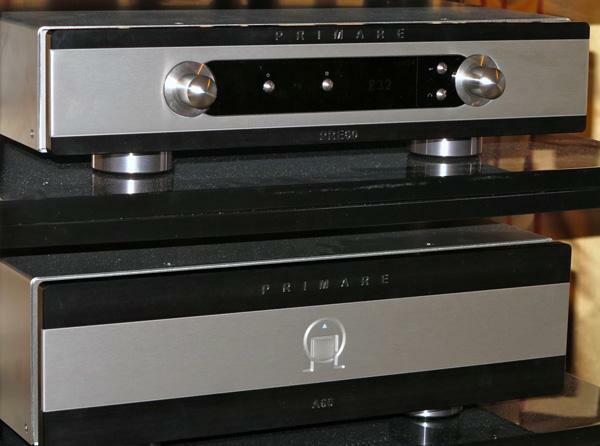 Fresh from Primare, the Swedish company whose name, correctly pronounced “prime air,” derives from the fact that audio moves air, were two new prototypes with unfinished faceplates: the PRE60 preamp/DAC ($10,000 target price) and A60 stereo power amplifier ($10,000 target price). Both are expected to ship by summer. Even though Simaudio’s Costa Koulisakis once explained in near exhaustive detail the relationship between Moon products and Simaudio, all I can remember is how good the components sound. You too may go over the moon about the three new products in my blog price range. 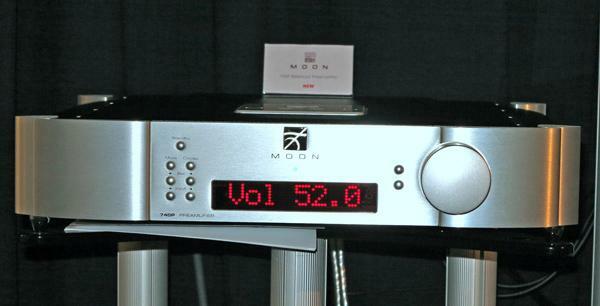 In numerical order, the Moon Evolution Series 610 LP phono preamplifier ($7000), based on the reference Moon 810LP that Michael Fremer reviewed in December 2012, is a dual-mono, fully balanced differential design with isolated oversized power supply with a pi-type filter; adjustable impedance loading, capacitance loading, and gain settings; and selectable equalization curves. It will even wash your windows. I expect there’s a movie industry connection to the name of this cable company, whose new Kraken flagship power cable goes for $8400/1.5m. With internal wiring a silver-palladium alloy, the housing is a combination of carbon-fiber and epoxy resin. Even the ceramic plug is a composite, complete with pins that are a silver-copper alloy with palladium coating. They also look as good as you’d expect for cable that is 100% handmade in Pasadena. 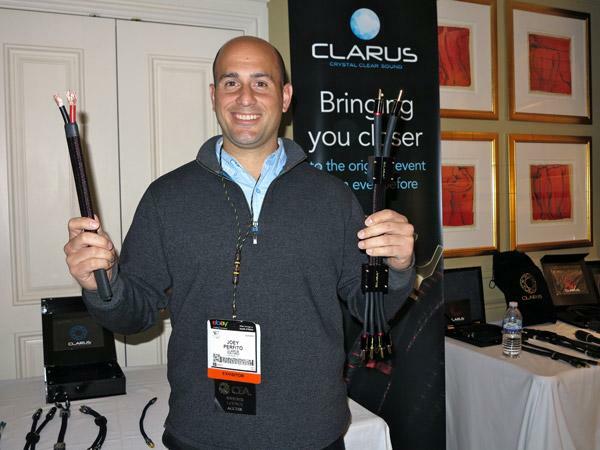 Clarus Cable, launched less than two years ago at RMAF 2011, is based in Orlando, FL. 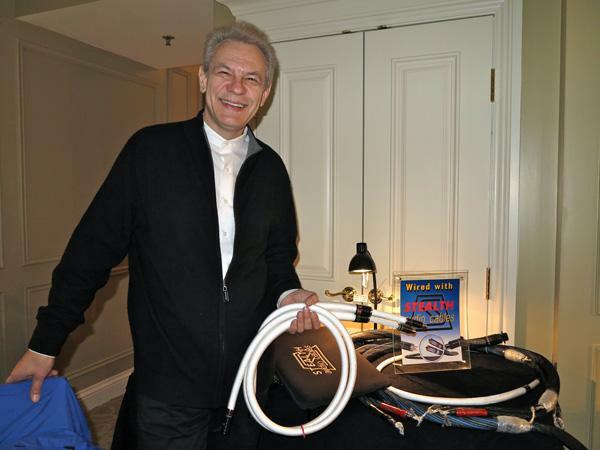 Produced by Gordon J. Gow Technologies, and designed by Jay Victor, it was developed after Tributaries Cable dealers asked for a higher-end cable for their customers. According to Joey Perfito, National Product Specialist, the Ohno Continuous Casting Copper (OCCC) design consists of thick and thin-gauge conductors, each individually insulated, to transmit different frequencies, plus one long, flat conductor to help support the midrange. The boxes, designed for aesthetic purposes, conceal the start of silicon tubes on the terminations. Prices range from the Aqua interconnect ($500/1m RCA) to Crimson ($1000/1m RCA). 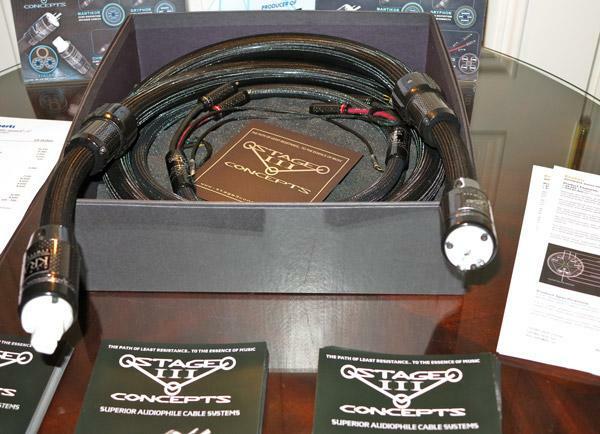 Thirteen years after the Maryland-based company’s founding, Stealth Audio Cables stand out for their unique geometry. According to R&D Director Serguei I. Timachev, the cables go from thicker to thinner to assist impedance matching in analog transmission. Handmade, including the connectors, prices range, to use interconnects as an example, from the “amorphous wire in Helium, VanCross geometry of Sakra v12 ($12,000/1m pair) to the pure 99.99% solid-core Gold Signal of PGS rev08 ($1000/1m pair). 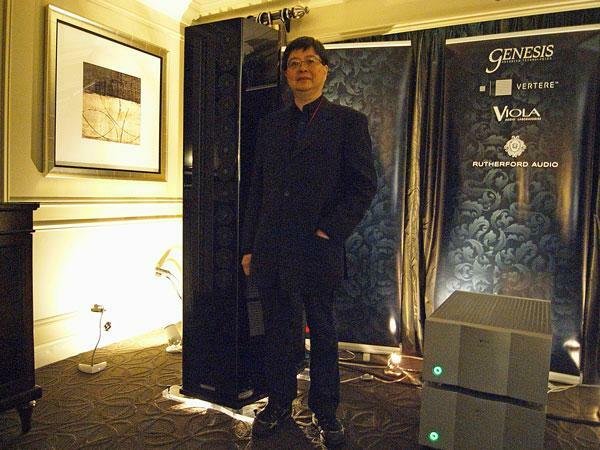 Gary Koh was showing off his new Genesis Advanced Technologies 2.2 junior speaker ($80.000/pair) with a superbly natural-sounding track from Canadian chanteuse Anne Bisson. The 2.2jr combines a 48"-high midrange ribbon with 12 of the 1" circular-ribbon tweeters used in other Genesis designs and two servo-controlled 12" aluminum-cone woofers, these driven by their own 1kW amplifier. 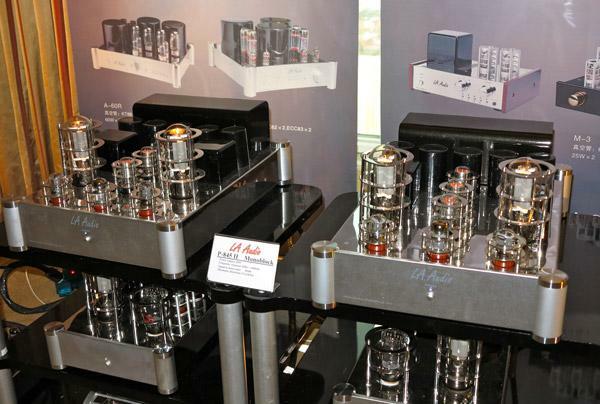 The rest of the system included Viola amplification and a Burmester phono preamplifier. 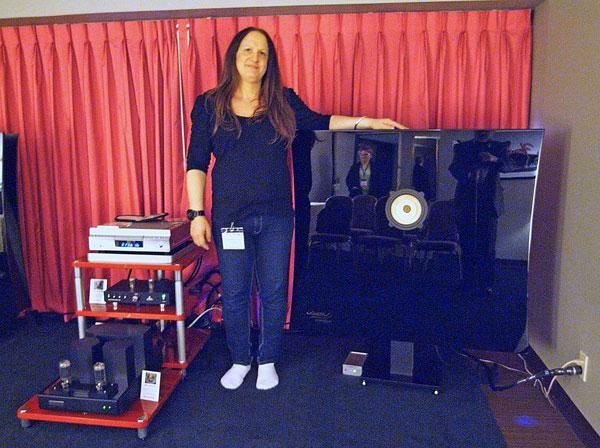 The German Voxativ Ampeggio Signature by Schimmel loudspeaker ($32,500/pair) was Stereophile's surprise Product of 2011, wresting well-balanced sound from its single drive-unit. At the 2013 T.H.E. Show, designer Inès Adler showed her Ampeggio Duo ($100,000/pair), which still uses a single full-range drive-unit, but this time field-coilenergized and with a wooden cone, said to have the same mass as a conventional paper cone but 100x stiffer. The large, wide, piano-lacquered enclosure horn-loads the rear of the cone and the speaker is claimed to have a 3dB point of 25Hz. Driven by KR amplifications, the 100dB-sensitivity Ampeggio Duos produced the kick drum on Dire Straits' "Sultans of Swing" with surprising weight. 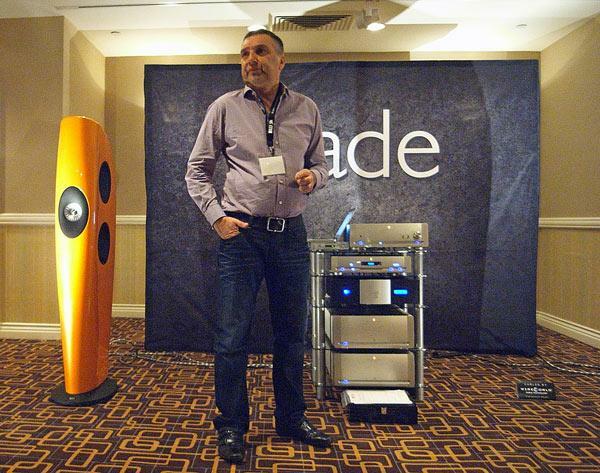 In a large, acoustically untreated basement room at the Flamingo, KEF's "Brand Ambassador" Johann Coorg, was getting superb sound from the same orange pair of Blade speakers ($30,000/pair) that he had demmed at last October's RMAF. Again using Parasound Halo preamp and monoblock power amps, Johann was playing files from J River Media Center running in a Windows environment on his MacBook Pro, courtesy of Parallels, to feed a Parasound ZDAC. (That way, he could use the Mac's native USB2.0 driver.) Cabling was all WireWorld and AC was conditioned with a Torus transformer.